As a native, country-boy Floridian, my visit to Babcock Wilderness Adventures in Punta Gorda, Florida was like reliving my childhood. My family owned 30 acres of “old Florida” back in the days before theme parks and gated communities. If you want to see something special, see the real Florida, see the old Florida, then Babcock Wilderness Adventures is the perfect place to start. Babcock Wilderness Adventures is located on the Babcock Ranch which is over 100 years old! This beautifully natural 90,000 acre ranch is bigger than the island of Manhattan – think about that for a minute! Upon our arrival at Babcock Wilderness Adventures, we viewed natural history artifacts and checked out the museum that was used by Warner Brothers in the 1995 film "Just Cause" starring Sean Connery. The bear trap in the museum is huge and gives you a little bit of an idea of the challenges people faced in the Florida frontier. Be sure to visit Lulu - the three horned cow and read about her life. Grab your camera. Where else could you get a photo like this? Sleepy (the screech owl) and Ole Yeller and Spot (the friendly snakes) are also on display for visitors to see. If you are feeling a little hungry, the Gator Shack Restaurant offers a good selection of food. The names of the menu items are fitting for the ranch. You might want to try The Cowboy (burger) or the Piney Woods Rooter (BBQ pulled pork) or The Yard Bird (chicken). The Gator Shack even offers Gator Bites (alligator nuggets). A children's menu is also available. The Souvenir Gift Shop is a great place to stop either before or after your tour. They offer unique items that relate to the ranch and the area including Saw Palmetto Honey. Kids will enjoy the children's area where they can read books on wildlife and color pictures while waiting on the tour buggy to leave. The ranch offers two tours - The Babcock Wilderness Adventure Tour - This 90 minute, narrated tour travels through the working cattle ranch. You go through four Florida ecosystems and see local wildlife “up close and personal.” Your guide gives you the history of the ranch and identifies the local ecosystems and wildlife. The Heritage Tour - This three hour tour gives you a chance to visit the Cypress Lodge for a great lunch and beautiful view. Lunch includes hors d' oeuvres, choice of meal and dessert. We enjoyed every minute of our tours The experienced guides offer in-depth descriptions of the birds, animals, plants and cattle and horses that make up this 90,000 acre ranch. They even have a native Florida Panther in a large natural setting that is a pleasure to watch. You should always have your camera ready as you travel through the ranch as gators will be available for great shots. 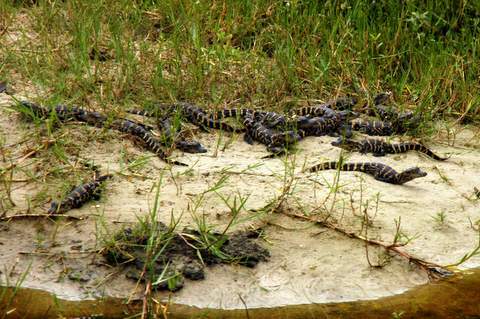 We were lucky enough to see 15 to 20 newly hatched baby gators sunning on the creek bank with their Mama guarding them. As your tour comes to an end, the guide stops the open-air bus and brings out a young gator. Everyone gets a chance to touch and pet it. Babcock Wilderness Adventures is a must-see attraction when you are in the Port Charlotte or Punta Gorda area of Florida's west coast. Babcock Wilderness Adventures is located at 8000 State Road 31, Punta Gorda, Florida 33982.